Savor, indulge, and unwind. 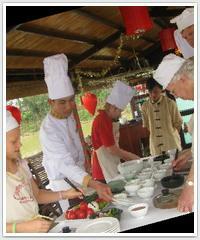 Enjoy the finest authentic Vietnamese cuisine, surrounded by spectacular river views on Cinnamon Cruises offering a variety of cruises for groups or individuals, from Cooking class in Hoi An, My Son and Cooking Cruise to a romantic Sunset Dinner Cruise, Cocktail Cruise or Dinner Cruise on Thu Bon river. 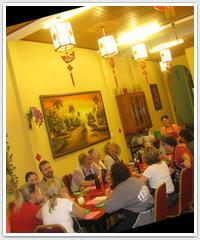 Meeting at our office, 32 Le Loi street at 08:00 or 15:00, you will be guided by our chef to the colorful market. This is a very good opportunity for you to communicate with sellers, get to know about their daily life in Hoi An and understand more Vietnamese ingredients and its substitution that we use for our cooking class on the boat. After leaving the market, we walk to the boat anchoring nearby. Upon boarding the boat you will be greeted by our crew and guided to a private table with your welcome drinks, then start cruising for 30 minutes to a very quiet and nice place on Thu Bon river and anchor here for the two- hour Hands-On cooking class conducted in English. You will have chance to discover the culture of Vietnamese culinary art and will prepare the same dish yourself after our chef finishes each dish. Full of joy and pride, you savor your own culinary creation. Back home, with full of emotion and recipes will help you to reproduce the dishes to make surprise to your family, your friends! After the cooking lesson, you will have lunch with what you have cooked and an extra dish will be served for you, as well. While you are having lunch, we cruise back to the pier and the crew will bid you a farewell at 12:30 or 19:00. Spend the rest of time to explore the lovely town of Hoi An. Coming to Vietnamese cooking class, at Gioan restaurant, you will have an amazing day with the Gioan cookery class and feel a wonderful difference of Vietnamese cuisine. Just two hours and thirty minutes, you can visit the local market and shop for local ingredients. We will teach you to cook Authentic Vietnamese Dishes of your choice from the menu at our family run riverside restaurant. Anytime, morning or afternoon and evening. We are flexible and everyone is welcome!! !